Saint Martin and Sint Maarten occupy the same island in the the Eastern Caribbean. The Northern portion of the island is French and is known as Saint Martin; the Southern portion is Dutch and is known as Sint Maarten. Originally claimed for Spain after being sighted by Columbus, the Dutch first occupied the island in the 1600s and set up salt panning operations. The Spanish reclaimed the island just a few years after Dutch settlement, but the Dutch refused to let the island go. Eventually Spain gave up claim to the island and it was given over to the Dutch and French, who divided the island. The two parts remain separate entities under the umbrella of France and The Netherlands. On the Dutch side the currency is the Netherlands Antillean Guilder, while on the French side the Euro is the official currency, however, both nations widely accept US dollars. English is widely spoken and is an official language along with French and Dutch. Saint Martin remains close cultural ties with its French roots, while the Dutch side embraces its Caribbean location. A visit to either Saint Martin or Sint Maarten means you can explore both nations and experience two very different holidays. The island is made up of volcanic peaks, white sandy beaches and an abundance of natural harbours makes this a boating destination and a popular stop with the yachting set. The islands are known for their nightlife, but also are popular for their history and eco-adventures. To find Saint Martin villa rentals by owner, for your next holiday, simply select St. Martin as the destination in the “BROWSE BY” tool bar towards the top of the page. If you have set vacation dates use the “AVAILABILITY SEARCH” box, which blends in/out to the right of the slideshow. Alternatively, you can simply browse through the following list of St. Martin villa rentals by owner. You may also be interested in Sint Maarten villa rentals by owner on the Dutch (south) side of the island of Saint Martin. Les Palmiers is THE premiere honeymoon villa in St. Martin (and possibly in the Caribbean) according to numerous magazines and online travel sources. In fact, Les Palmiers was selected for the cover photo of the popular Conde Nast Traveler magazine in a recent edition. But don’t be fooled; as famous and popular as this villa is, it’s still a charming, romantic, and VERY private escape. Les Palmiers sits directly on Baie Rouge Beach. You won’t find any crowded resorts around here; in fact you’ll have a hard time finding anyone else at all. Les Palmiers is one of just 14 villas located in a private gated community (with 24 hour private security service) called the Residences Baie Rouge. Find out more about Les Palmiers, Baie Rouge Beach, Terres-Basses, St. Martin. French for Love’s Nest “Nid d’Amour” is simply superb! This fully air-conditioned 2 bedroom Saint Martin villa rental offers Spectacular Views over Baie Rouge which combined with the soft sea breezes transform this villa into the perfect romantic hideaway or simply said the ideal Love’s Nest. A fantastic heated pool is just add-ons to this seductive Love’s Nest. Nid d’Amour is less than 3 minutes drive from Baie Rouge Beach. Can be rented as a 1 or 2 Bedroom villa! Find out more about Nid d'Amour, Baie Rouge, Terres-Basses, St. Martin. Located on beautiful Baie Rouge Beach, Saint martin, Beau Rivage enjoys magnificent sweeping views of the beach, ocean and Anguilla. Beau Rivage's huge loggia/veranda boasts a sparkling pool, and is surrounded by comfortable single and double chaise lounges, plush seating, and stone mosaic tables. Enjoy dining in the beach side gazebo, only feet from the waves, or in the luxuriously appointed great room. Inside, antiques are combined with elegant furniture selected or designed by Francis Mayes, the best selling author of "Under the Tuscan Sun", bringing a romantic and old world warmth to this special St. Martin villa rental. Find out more about Beau Rivage, Baie Rouge Beach, Terres-Basses, St. Martin. Find out more about Terrasse de Mer, Baie Rouge, Terres-Basses, St. Martin. Built on 2 levels with 2 swimming pools and with Magnificent Sunset Views, Superb Tropical surroundings and within 10 minutes walking distance to beautiful and secluded Plum Bay Beach, Grand Blue sets a new concept where Elegance and Serenity are intrinsically blended. An ideal Saint Martin villa rental for a group of friends. Can be rented as a 2-3 & 4 bedroom villa. Find out more about Grand Bleu, Baie aux Prunes (Plum Bay), Terres-Basses, St. Martin. L'Oasis is Moroccan inspired with contemporary overtones. This secluded and gated beachfront estate, completely renovated in 2010, offering total privacy at the end of Baie Rouge Beach, Saint Martin, is fit for royalty. L'Oasis has a dramatic domed entry with a fountain, a fully equipped media room with large Plasma TV, seven king bed suites, a gourmet kitchen with a full-time chef make this magnificent property the best of the Caribbean. L'Oasis also features a full SPA with a gym room equipped with Multi-Station Universal, a Tread-mill, an Elliptical, Free Weights, Plasma TV, Sound, an exterior Jacuzzi, a Massage room, a Manicure/Pedicure area, a Bathroom with Steam room, Shower and Toilet. When it comes to swimming, guests can choose from a dip in the sea, or either of the two swimming pools... one huge infinity pool is located at the villa and the other pool on the sand with a spectacular beach pavilion. Can be rented as 4-5-6 or 7 bedroom St. Martin villa rental. Find out more about L’Oasis, Baie Rouge Beach, Terres-Basses, St. Martin. Le Chateau des Palmiers, Saint Martin, an expansive world-class estate, is the new "jewel" of the Caribbean. This one-of-a-kind chateau has embraced the spirit of the Caribbean with the elegance of a fine French hotel. Featuring a 5-bedroom ocean side villa and a 4-bedroom garden side villa, it presents an intimate, relaxed and attentive environment within the walls of a gated enclave. Situated on the white sand beach at Plum Bay, St. Martin, it features many amenities including a huge heated pool, fitness center, tennis court, and covered outdoor bar, billiards and dining areas. Other amenities include air conditioning in all rooms and a four car garage. With its western exposure, you will be able to enjoy the Caribbean's best sunsets. Can be rented as a 5 or 9 bedroom villa. Find out more about Le Chateau des Palmiers, Baie aux Prunes (Plum Bay), Terres-Basses, St. Martin. WOW, what a view!! Just in Paradise, the newest addition to our St. Martin villa rental collection, is a brand new (completed in October 2012) 3 bedroom villa in the gated Terres-Basses community of Saint Martin offering sweeping views from La Samanna at the far east end of Long Bay Beach all the way over to Plum Bay Beach and its west-facing sunset vistas. Just in Paradise was professionally designed and decorated with discerning rental guests in mind. The contemporary furniture is comfortable, the “pop art” is visually stimulating, the kitchen is high end and functional, and the infinity jet tub (not a hot tub) flowing into the giant infinity half-moon pool is absolutely spectacular. Find out more about Just in Paradise, Plum Bay, Terres-Basses, St. Martin. Beautiful Day O is a fabulous 3 bedroom St. Martin villa rental located on sublime Plum Bay Beach, with its beautiful sunsets and crystal clear water. The villa has a delightful outdoor terrace with large pool and poolside gazebo overlooking the beach. The spacious living and dining area and large adjoining gourmet kitchen open out to the terrace and enjoy the beautiful ocean view. Find out more about Day O, Plum Bay Beach, Terres-Basses, St. Martin. Located directly on Plum Bay Beach, this delightful Saint Martin villa rental offers tropical elegance and as the name Soleil Couchant suggests, spectacular sunsets. The swaying palm trees and foliage around the pool deck and gazebo provide a beautiful setting for entertaining or just lounging while on vacation in St. Martin. This comfortable beach house offers a terra cotta tiled, open plan living area which harmoniously joins the covered terrace via French doors. Both spacious, light-filled bedrooms are accessible from the pool terrace and have generously sized en suite bathrooms. Find out more about Soleil Couchant, Plum Bay Beach, Terres-Basses, St. Martin. Happy Bay Villa is a fabulous, fully air conditioned, 4 bedroom villa, located on the northern coast of Saint Martin within walking distance of Friar’s Bay and the beautifully secluded beach at Happy Bay. This St. Martin villa rental has just completed a renovation with new furniture. Happy Bay Villa has a superb, unobstructed view of the ocean from the infinity edge heated pool, sun deck and gazebo. The interior living spaces of this St Martin holiday villa include a large air conditioned living room/dining area and a gourmet kitchen, all opening out to the pool deck. There is also a media room with large flat screen TV. Each of the 4 spacious bedrooms has a fabulous ocean view from large French windows opening out to the pool terrace. Can be rented as 2-3 or 4 bedroom villa! Find out more about Happy Bay Villa, Mont Choisy, Happy Bay, Saint Martin. La Favorita is absolutely dazzling! With a superb open view to the Caribbean Sea, Baie Longue and surrounding areas of Saint Martin. This new and beautiful 3-bedroom St. Martin villa rental is suitably positioned, just 2 minutes drive from both Baie Longue (Long Bay) and Plum Bay (Baie aux Prunes) beaches. Its modern design combined with the warm decoration and the privacy of Terres-Basses makes this villa La Favorita among the favourites. Find out more about La Favorita, Baie Longue, Terres Basses, Saint Martin. Welcome to the new Clair de Lune, Baie Longue, Terres-Basses, Saint Martin. The terrace is larger (now over 3,000 square feet with new chaises lounges); the view is wider (180+ degrees unobstructed); the pool is brand new (flush Travertine and Riverrock-finish lap pool cascading to a lower shallow pool perfect for children or for a massage with water-jets); the master bedroom and all bathrooms have been renovated; new furniture and decor in the living room and 3 other bedrooms (including a new HD 3D 55” Samsung Smart TV in the living room); a new fully air conditioned “Zen Room” surrounded by a beautiful tropical garden, perfect for a massage or reading a book away from guests, or to watch a TV program, savoring the tranquility of this beautiful property; and last but not least introducing complimentary L’Occitane products throughout. Find out more about Clair de Lune, Long Bay, Terres Basses, Saint Martin. An enchanting neoclassical Caribbean island retreat; Amber lies within the Terres Basses - St. Martin's most prestigious community. This elegant, fully air-conditioned Saint Martin villa rental enjoys a splendid setting high above the exquisite Baie Rouge Beach. Here breathtaking vistas unfold across the Caribbean Sea and to the island of Anguilla. Spacious yet inviting living areas are featured along with 3 lovely bedrooms. Enjoying the idyllic natural backdrop, wraparound terraces open alongside the dramatic seaside heated swimming pool appearing to merge with the endless turquoise waters. Find out more about Amber, Baie Rouge, Terres Basses, St. Martin. Belle Etoile, an exceptionally scenic and secluded setting of 4 ½ acres, this magnificent estate enjoys breathtaking views of the sparkling Caribbean Sea. Located just minutes away from Plum Bay Beach, Belle Etoile is indeed a magnificent Saint Martin villa rental, which has just been renovated to become one the most luxurious hillside villas in Terres-Basses. It is the perfect holiday villa for a group of friends. Featured is a huge shallow-entry heated pool with a Jacuzzi and a very large deck for sunbathing. The interiors of Belle Etoile combine Caribbean casual living with continental elegance, fitted with luxurious details like tiled flooring and artwork. While everything is top-quality, the use of cool, natural colors offers a calm, laid-back atmosphere overall. This St. Martin villa rental is fully air-conditioned and includes the services of a chef (cost of food and drinks is not included). Find out more about Belle Etoile, Baie aux Prunes / Baie Rouge, Terres Basses, Saint Martin. Inspiring sunsets over the beautiful Caribbean Sea, great comfort and immaculate elegance have combined in this magnificent new hill-side Saint Martin villa rental to create the ultimate "Ambiance" for an everlasting and wonderful vacation experience. Ambiance villa in Saint Martin is simply a fantastic family retreat and the ideal place for a holiday or special occasion. Find out more about Ambiance, Baie Longue, Terres Basses, Saint Martin. Azur Reve is a spacious, luxurious villa atop Morne Rouge in exclusive Terres Basses, Saint Martin. The name means "Blue Dream" and this home is a dream, with large expanses of indoor/outdoor living space for your relaxation while on vacation. When you enter Azur Reve, you are greeted by a magnificent covered Great Room, entirely open on one side. There are ample sitting areas and a wet bar with mini-fridge, ice-maker and stereo for entertaining. The view from the Great Room is over the pool to the sea and the island of Anguilla. Azur Reve can be rented as a 2, 3 or 4 bedroom Saint Martin villa rental. Find out more about Azur Reve, Anse aux Cajoux, Terres Basses, Saint Martin. Escapade is located in a very exclusive and secure community of only 6 villas in the heart of the Terres Basses, Saint Martin, and provides exceptional views of Simpson Bay, the sparkling Caribbean Sea and the islands of Saba, Saint Eustatius and St. Kitts. While its location and exposure take full advantage of the cooling trade winds during the day, its unique tropical garden steals the show at night. Escapade villa enjoys the use of a shared marina and tennis court. Can be rented as a 2, 3 or 4 bedroom Saint Martin villa rental. Find out more about Escapade, L’Anse aux Acajoux, Terres-Basses, St. Martin. Find out more about La Bastide, Baie Longue, Terres Basses, Saint Martin. A beautiful Saint Martin villa, nicely furnished and overlooking La Samanna Hotel and the beach of Baie-Longue (Long Bay), La Bella Casa offers gorgeous sunsets and views of the Caribbean Sea. La Bella Casa is ideal for family vacation or for a large group of friends. This Saint Martin villa rental, which has nine large bedrooms (2 located in a separate cottage with its own private pool, living room and kitchen). La Bella Casa can be rented as a 4-5-6-7-8 or 9 bedroom St Martin villa rental. Find out more about La Bella Casa, Baie Longue, Terres Basses, Saint Martin. Find out more about La Nina, Baie Longue (Long Bay), Terres Basses, Saint Martin. The wide open design of this spacious four bedroom Saint Martin villa rental is in complete harmony with its natural setting. The view from the living room of La Pinta villa stretches from the tastefully furnished deck to the distant horizon giving the impression of even more space. A covered porch with outdoor dining and lounge areas gives La Pinta an authentic Creole flavor. La Pinta also features Caribbean sunset views, lovely gardens, a tennis court and a gym room. Need more bedrooms for your St Martin vacation? "La Nina", which shares the lot, can provide two more bedrooms to accommodate an extended family holiday. La Pinta can be rented as a 2-3 or 4 bedroom Saint Martin villa rental. Find out more about La Pinta, Baie Longue (Long Bay), Terres Basses, Saint Martin. Find out more about La Provencale, Baie Longue, Terres Basses, Saint Martin. This new, beach front Saint Martin villa rental is absolutely gorgeous with astonishing views where the turquoise Caribbean Sea and the clear blue sky are only separated by the island of Anguilla emerging in the far horizon. This fully air-conditioned vacation villa is located in the gated Baie Rouge Residence, Saint Martin. Altough only steps away from the water but above sea level, La Vie en Bleu provides comfort and total privacy to those ready to enjoy the swimming pool, jacuzzi and gym featured in this holiday villa. Find out more about La Vie en Bleu, Baie Rouge Beach, Terres-Basses, St. Martin. Find out more about La Samanna - Mouette, Baie Longue, Terres Basses, Saint Martin. Sucrier villa is one of four newly constructed villas, which epitomize graceful Mediterranean architecture and take the La Samanna experience to a new level. Featuring over 4,600 square feet of space, generous living quarters, master bedrooms with alcoves and oversized private terraces, these Saint Martin villa rentals are palatial yet comfortable and laid back, with a distinct Caribbean spirit. Find out more about La Samanna - Sucrier, Baie Longue, Terres Basses, Saint Martin. Find out more about Little Jazz Bird, Baie Rouge Beach, Terres-Basses, St. Martin. Sula is one of four newly constructed villas with graceful Mediterranean architecture that take the famous La Samanna Resort experience to an entirely new level. Sula villa features over 4,600 square feet of luxurious space, master bedroom with alcove and oversized private terrace. Sula villa is palatial yet comfortable and laid back, with a refined Caribbean spirit. This Saint Martin villa rental has 3 bedrooms, 3 bathrooms and is located at the La Samanna Resort and Spa, Baie Longue (Long Bay). Find out more about La Samanna - Sula, Baie Longue, Terres Basses, Saint Martin. Tiaris, Baie Longue, Saint Martin, is a 4 bedroom, 4 bathroom holiday villa featuring over 4,600 square feet of luxurious privacy and space. This St. Martin vacation villa has generous living quarters, master bedrooms with alcoves and oversized private terraces. This holiday villa is palatial yet comfortable and relaxed with a very Caribbean spirit. Tiaris of one of four newly contructed villas adjacent to the La Samanna Resort and Spa on Long Bay. Find out more about La Samanna - Tiaris, Baie Longue, Terres Basses, Saint Martin. Petite Plage 4 has a combination of antique and contemporary furnishings which make this gorgeous and spacious fully air-conditioned 5 (4+1) bedroom, beach front villa a unique place for a wonderful vacation. This Saint Martin villa rental features a huge swimming pool, film projector in living room, plasma TV in each bedroom, but also in the gourmet kitchen, satellite TV, media-room with large plasma TV, Jacuzzi, etc.. Located on Petite Plage, a quiet crystal clear water and white sandy beach on the Northern part of Grand Case village, the gourmet capital of St. Martin. Petite Plage 4 villa offers some of the most scenic Caribbean sunsets around. Find out more about Petite Plage 4, Petite Plage Beach, Grand Case, Saint Martin. Petite Plage 5, Grand Case, Saint Martin, is a beautiful, very spacious, 6 bedroom (5+1), 6 bathroom, fully air-conditioned, beach front holiday villa. The contemporary furnishings throughout make this Saint Martin villa rental a unique place for a wonderful vacation. The holiday villa features a huge swimming pool, film projector in living room, plasma TV in each of the beautiful bedrooms and also in the gourmet kitchen, satellite TV, media-room with large plasma TV, Jacuzzi, etc.. Petite Plage 5 is located directly on Petite Plage, a quiet crystal clear water and white sandy beach on the Northern part of Grand Case village, the gourmet capital of Saint Martin. This St. Martin villa offers some of the most scenic Caribbean sunsets around. Find out more about Petite Plage 5, Petite Plage Beach, Grand Case, Saint Martin. Lune de Miel, the name of this new, two bedroom Saint Martin villa rental speaks for itself - it is French for “Honeymoon”. This wonderful honeymoon or other special occasion villa, located on the hillside in Terres-Basses of St. Martin, offers great vistas of the Caribbean Sea. The swimming pool of Lune de Miel is exceptionally large for a two bedroom villa. A romantic and spacious gazebo adorns the pool area. Lune de Miel can be rented as a 1 or 2 bedroom Saint Martin vacation villa. Find out more about Lune de Miel, Baie Longue, Terres-Basses, Saint Martin. 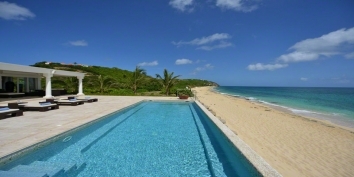 Inspired by the Moors, this elegant, beachfront, Saint Martin villa rental is truly exceptional. Serena villa is located in a gated community with only thirteen other St. Martin vacation homes. The spacious interior provides approximately 7,500 square feet of roofed living space. Its vaulted ceilings blend with the terrace, which is surrounded by white columns and archways. Slightly elevated, Serena commands a beautiful view of Baie Rouge Beach and the island of Anguilla. This St. Martin holiday villa features a media room area with a huge flat screen TV and a reading area along with comfortable couches. A large gazebo overlooking the ocean has just been added and the indoor dining are now opens onto a terrace. Find out more about Serena, Baie Rouge Beach, Terres-Basses, St. Martin. Is your Saint Martin villa rental already unique on CARIBIQUE? If not, find out how to list your Caribbean villa now!